What follows is a guest post from OneSight supporter Julie Bart. What do the letters FPTOZLPEDPECFD mean to you? These letters form the first 4 rows of the Snellen chart invented by Herman Snellen in 1862 to test visual acuity, including myopia, commonly referred to as nearsightedness. The subject of myopia is of growing importance to health providers and governments as the number of people affected is on the rise. One reason it is a concern is that so many people are unaware they have a vision issue, do not admit they have an issue, or can’t access the help they need to correct it. In fact 1 in 7 people worldwide needs vision correction and have no way to get it. These letters figure prominently in a memorable cinema moment from the 2000 film Dancer in the Dark. The film’s main character, played by Bjork, has a degenerative eye condition. She works in a factory and is saving hard for her son to have an operation to remedy his sight. In order to keep her job, she cheats when reading the eye chart. This moment in the film speaks to a problem that is a serious reality for many across the world—finding ways to cope with their inability to see clearly. Common examples include sitting inches from the television set or relying on others to read distant signs for them. This is a particular problem for children, who do not know are not always able to articulate that they have a vision issue. The reasons for these behaviors are often to draw attention away, due to modesty, fear of bullying perhaps or, as in Selma’s case, to be able to keep a job. OneSight staff and volunteers hear these stories from patients all too often. 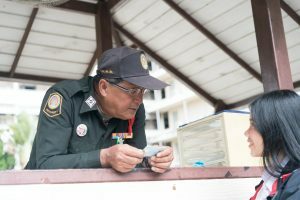 At a 2017 clinic in Thailand, a 59-year-old security and parking guard named Suta who had never before had glasses. His myopia made it so that he could not see his own hands out in front of him. Suta’s primary responsibility at work is to record the color and license plate number of all cars and motorcycles that come onto campus. Suta said, “My friends and co-workers have always helped me memorize the color and number of the vehicle by its shape.” He described feeling like he had been hiding his whole life and felt “reborn” after receiving his glasses and seeing the world clearly. In addition to physical challenges, not being able to see the world clearly can present emotional challenges such as isolation and depression. Younger patients that OneSight has served have told stories of not having the confidence to look other people in the eye, feeling unsafe riding a bike, or not being able to recognize people talking to them. Older patients can feel cut off from their communities as their vision issues can lead to mobility issues and make it difficult for them safely get around. A Rwandan man and OneSight patient named Gregoire was unable to keep working as a farmer and bricklayer after his sight deteriorated. He was bumping into things and unable to leave his own home for fear of not being able to navigate the world. Once he got his glasses he was able to go back out in his community to reconnect with the people in his village. His wife was thrilled to see him get his independence and his spirit back. Remember that memorizing the letters on the chart or coping day-after-day with vision issues isn’t just something that happens in the movies. So what can you do to help support those with uncorrected myopia and other refractive error issues? Be on the lookout for coping behaviors that may suggest someone is having trouble seeing. Examples include squinting, sitting very close to the board, not paying attention in class, bumping into things while walking, and trouble reading or driving. Volunteer to participate in a vision screening event in your community. Encourage them to visit an eye doctor if one is available. Donate to OneSight to help them bring vision care access to the 1.1 billion who need it. We can all be advocates and allies for those who need access to an eye exam and a pair of glasses. And it’s a critical part to play, because clear vision reveals to each of us what we are capable of.